St. Louis, Mo. was recently identified as the nation’s top startup city because it wrapped up 2015 with the highest annual growth in venture capital funding. But financial backing isn’t the only benefit entrepreneurs will find in the city just west of the Mississippi River. Known as a hub of biotech and plant science research, St. Louis offers plenty of other startup resources and a cost of living that’s roughly 5 percent below the national average. St. Louis is one of the top startup scenes based on the average annual-growth rate in investment deals, according to Mattermark, which collects and analyzes data to help investors track thousands of fast-growing startups. “The city’s the tops for startup heat, with a whopping 342.7 percent deal growth in 2015, and 33.02 percent average growth since 2012,” Mattermark says. LockerDome is a good example a young investment-worthy growth company. An interest-based social network founded in St. Louis, it has grown from 10,000 active users a month three years ago to more than 75 million today and attracted more than $18 million in capital, according to National Public Radio. Support for smaller St. Louis startups could come from the equity-free competitive grant program, Arch Grants. This non-profit organization boosts economic development and attracts innovative early-stage entrepreneurs by providing $50,000 grants plus services like discounted office and residential space, educational programming, and talent acquisition. One Chicago startup, FoodEssentials, moved to St. Louis after winning an Arch Grant, noting that Chicago never provided that kind of support. Government incentives like the Missouri Works Program are an asset, too. This tax credit program, which is designed to create quality jobs, persuaded Square, the credit card processing company, to open an office in St. Louis. St. Louis also offers plenty of community work space, such as CIC Coworking inside the Cortex Innovation Community, a 200-acre innovation hub and technology district in St. Louis’ historic Central West End and Forest Park Southeast neighborhoods. And it has accelerators targeting specific growth industries, like the ITEN for tech startups, SixThirty for financial technology businesses, and the BioGenerator, which has provided early stage funding and support for 65 biotech companies. St. Louis is bound to attract more ag-tech startups since it won a $500,000 U.S. Commerce Department grant in 2015 to support an innovation hub in Creve Coeur, just west of St. Louis. The center will strengthen regional economic growth, globalization and commercialization in bioscience research. 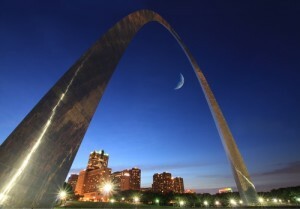 Your business can seem more approachable by selecting a local phone number in the 314 area code that serves St. Louis. With Halloo you can route calls to your employees anywhere. Get your local phone number today! This entry was posted in Halloo, Local phone numbers, Small Business by Caren. Bookmark the permalink.